I'm currently working on the implementation of a code to generate pdf report via LaTeX from Shiny. The LaTeX code as well as the knitr compilation on Rstudio are fine, only the Shiny part is new for me. Finally, a single variable, for example the sum of all '+' on the table is interactively updated when the cell is clicked so that I can use it in the pdf. As an example in the first case the variable is 6 but would become 4 in the case 2. 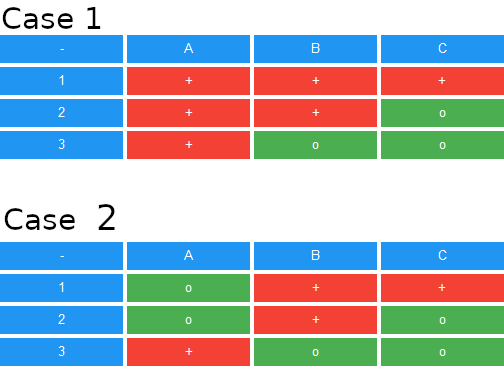 How to obtain such responsive table on Shiny (Layout + behavior) ? And how to extract data from it (0 or 1) to use it in calculations ? I would only need a minimal example with few rows and columns so that I can then create the rest and share the results if anyone is interested. I do not know how to do this with buttons. Below is a rough example using check boxes. I expect it is not good enough to meet your needs but perhaps it can get you started. Your answer fits perfectly what I was looking for , it is more than a good starting point and the check boxes are also a good option. Thanks a lot for this output and I will let you know if I manage to find a way to implement the buttons.